Paradigm Shift is an concepted dance battle event designed to bring the more street-style battle competition format into a more contemporary dance setting. Held for the first time in Singapore in 2017 by Frontier Danceland, the competition brought the most talented street and contemporary dancers head-to-head in a battle that was not only interesting but also enriching for everyone involved. It introduced a new format of competition that brought its own lane alongside established competition routes. 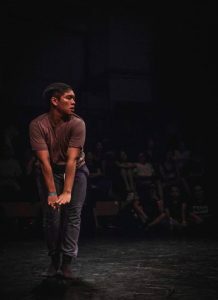 The second iteration of the event, Paradigm Shift: Shifting Into Second, was held as a collaboration between Frontier Danceland and Nanyang Academy of Fine Arts (NAFA). The event took place on 19-20 May 2018, with the battle competition on the 19th and a chain of workshops on the 20th. The event also collaborated with Gigi Art of Dance’s Choreonite Vol. 7 event, where the winner of Choreonite would be given a free pass to join two workshops and the battle competition. My name is Reba Aryadi, and due to a series of fortunate events, I was chosen to go to Paradigm Shift: Shifting Into Second. I did not win Choreonite Vol. 7, however due to circumstances surrounding the winner (Ms. Elly had a very complicated relationship with the visa process, it’s a epic tale longer than the Mahabharata, believe me), the board of judges and sponsors thought it would be appropriate for me to go in her place. It was a decision that shocked me but I was very, very grateful for it as it allowed me a chance to go to this amazing event. The whole circumstance of the event is pretty fantastic. Street style dance competitions have always been on the more competitive side, focusing on personal skills and showcases of abilities in a very head-to-head, impulsive and spontaneous manner. The organizers believed this working ethos would be great to introduce to contemporary dancers, who are more used to systematic processes of creating and performing. While a lot of artists have started to realize the importance of sharing knowledges between street and contemporary styles, not many have done concrete steps to allow this process of sharing to begin. Putting contemporary dancers against street dancers in a battle format, like what Paradigm Shift did, is a solid boost towards that goal. However, the battles themselves are not as clear cut as a normal street style battle would be done usually. Each round, from preliminary, Top 16, Top 8, Top 4, and Finals, has its own twist that would ease contemporary dancers into the battling lanes while simultaneously challenging street dancers who are used to the speed of the system. The preliminary round was a sort of showcase, but each contestant would have to improvise and work with the dancers before and after them. The first dancer would come in, dance alone for 45 seconds, and then have 45 seconds to introduce the next dancer into the stage. There were around 40 dancers of different styles in the preliminary round, where they were all judged not only on their showcase of personal skills, but also in how well they worked with the other dancers. Out of this round, 16 dancers were chosen, and I was one of them alongside with Mr. Kamil and Ms. Gigi. We went back-to-back and it became a nice showcase of our traditional Indonesian and Malay dances, happening like a conversation between cultures. The Top 16 round went on as a traditional battle format, two contestant facing one another in a head-to-head battle with two turns each, but with less clear timing rules that sometimes become a duet performance. I lost in this round to my good friend Zie from Team YOMO, which was nice since it was our first battles ever* and I’ve been having a pretty good time. The Top 8 contestants were split into two groups and were given parts of a song each, and they have 10 minutes to come up with a solo performance. Both groups, however, created a whole concepted performance which was a delight to watch. Two contestants from each group was chosen to become the Top 4, and they were asked to create a duet with a judge or instructor from the event. The two finalists, Luqman and Nic Chung, were part of the same group as The Mellow Maniacs, creating a truly riveting performance as their “battle” became a collaboration and landing them as the co-winners of Paradigm Shift: Shifting Into Second. The event didn’t end there, however. The following day, collaboration workshops were held in NAFA and Frontier Danceland and each class was amazing to behold. I joined in two classes, Christina and Amin’s class and Adele and Sista Beast’s class. The first class was a collaboration between a waacker and a contemporary dancer, proposing that you can translate moves between genres and interpret the music through different layers. Amin’s waacking moves were done by Christina through her legs, and Christina’s contact improvisations were layered on top of Amin’s movements, creating wonderful and/but challenging moments throughout the workshop. A wonderful new friend from NAFA worked with me in the partnered choreography, where we both assumed roles we weren’t familiar with (me as the contemporary partner being lifted, and him as the waacker who does crazy hand movements). We ended up with me being lifted on his legs and him waacking underneath me. It was magical, and not as inappropriate as it sounded. The second class was even more eye-opening, as Michelle or Sista Beast introduced the concept of Krumping as a form of being vulnerable rather than the violent outrage that the genre is more popularly known for. Her concept of giving a hundred percent energy and then immediately coming down to zero as you have nothing else left to give introduced Krump in a different light for me. The storytelling potential brought more similarities with contemporary, as Adele’s emotive movements became accentuated, rather than contrasted, by Krumping. The class were more stilted than Amin and Christina’s, with each instructor exploring together with the participants, but ended up being more touching and revealing by the end. I wasn’t able to join the closing jam session of the event as I had a plane to catch, but it had been a very enlightening two-day session. The event was challenging, first and foremost. Coming back to the competitive battling scene, no matter how exploratory and unpretentious it was, was still a very nerve-wracking effort. Physically it took a lot out of my tired and recently untrained body. Plus, I fasted through the two days, dancing almost more than 6 hours each day with very little sustenance. The mental nourishment was what kept me going, as I came into each class being very excited to learn, both from the Paradigm Shift classes and the free O2 School classes given to me before the Paradigm Shift event. 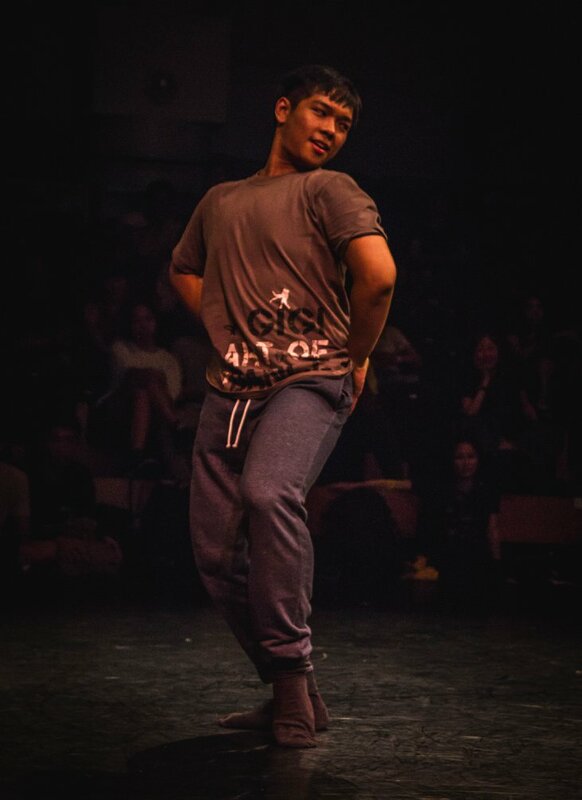 I got a lot of knowledge that was given both explicitly and implicitly from the classes that will be beneficial to have as a dancer, teacher, and choreographer. The most important lesson, I’d say, would be the realization that there is always room to grow, no matter how old, experienced, or trained you are. Dancers from all genres and levels were able to gain something from the experience, and I now believe even stronger that to be a better version of yourself, you always have to be ready to change gears and go into a new frontier, unafraid.